I work for a company called JUMP Branding & Design Inc. full time. It’s a great company to work for. If you want to be really creative this is the place to be. We’re a company based on Toronto. I’m a senior graphic designer there. One of our clients are z-teca gourmet burritos. If you haven’t been there to eat yet, you MUST. Their food is so amazing and the restaurants they have are all really cool, modern and clean. JUMP also did the design for all the restaurants. Talk about having creative freedom. Every store we do for z-teca has a unique feel to it based on it’s location. I love working on anything for z-teca, the client is great to work with and loves to have some fun and push the limit’s of design. On this piece, I had total creative freedom. I started with a sketch, supplied reference to colour, look, patterns, anything to get the point across. I also came up with the writing on this one. 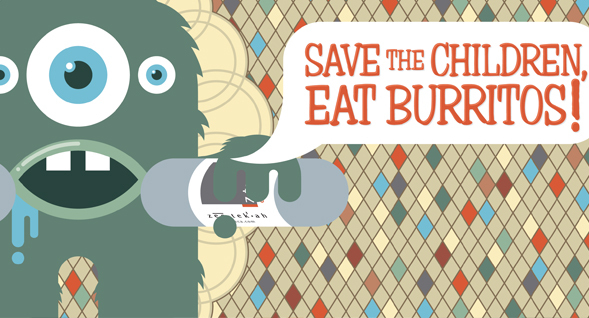 The idea was that monsters eat children, so by eating burritos the children are safe. Ah. Like a twisted fairy tale. Ha ha. Once the sketch and concept was approved I started illustrating the piece in illustrator. Again, I can’t stress how fun it was to do this piece. I was going for something fun and youthful. Currently this piece is printed and at the York University z-teca location. It’s worth it to go see a z-teca. The space is awesome, the art is great and the food is delicious. Man, I’m craving a burrito now.